Imagine Christmas Lasting All Year Long! Bob Hope was wise, don’t you think? 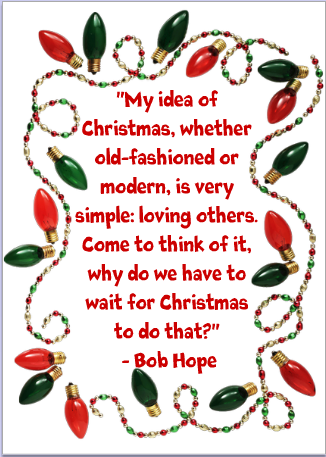 The idea that we can make Christmas last all year long simply by loving others (and ourselves) is the best gift of all! Why not allow the gift of love to permeate the whole year long in all you do, say and are! Many people joyously welcome the holiday season of giving with such aplomb, going out of their way to give to others during this time. However, there are those who fret about our spending and trying to find the perfect gift to give to family, friends and loved ones. Truly, I know a gift that we can give a gift that is priceless and that doesn’t cost a single dollar. We can give the gift of love, gratitude and forgiveness. Imagine receiving such a gift in your life ~ Imagine giving such a gift to others! What if we were to give that gift of gratitude and love all year long? Wouldn’t it make every day special? Wouldn’t it evolve into a year long celebration of love and gratitude? I can imagine such a world, can’t you? So this year, let’s try to bring that Christmas spirit of love, peace, laughter and joy to everyone’s hearts and allow it to grow and shine throughout the year! What a wonderful world this would be! 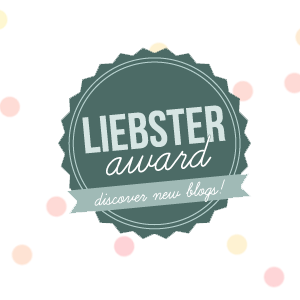 My dear friend at Enchanted Seashells winner-winner-winner-liebster-award was kind enough to nominate me for the Liebster! I am honored to be blessed twice by the lovable Liebster although this one is a bit different from the last one I received. A different Liebster emblem and now the magic of 11s. As a game player and rule breaker, I accept with much appreciation! Thank you my friend! I need to nominate 11 other under-appreciated blogs with less than 200 followers. Next comes 11 juicy tidbits about myself and then answer the 11 questions sent to me, and create 11 questions for my chosen group. 1. I love ‘old’ music and know all the lyrics for songs way before my time. 2. I am an incurable romantic. 4. I met my very best friend in 4th grade when she moved to our school ~ and we’ve been best friends for over 30 years! 5. My favorite holiday is Christmas! 6. I love celebrating my birthday and I celebrate for as long as my family will allow ~ usually 2 weeks! 7. I love gadgets ~ especially for the kitchen. 8. I’d prefer to make reservations than to actually MAKE dinner! 9. I long to learn to horseback ride. 10. I love my SendOutCards business because it allows you to send cards for less than $1 ~ and the feeling you give and get is priceless! 11. I really love my life. 1. How old were you when you first learned to read? I don’t remember ~ probably 5? 3. What’s your favorite holiday dessert? Chocolate…anything…but without nuts! 4. What is a Merchant Marine? Ok, so I took so long to write this post that you answered it for me! 🙂 But for those who didn’t already know the answer: The Merchant Marine supplements the military in times of war, transporting goods and equipment to areas where it is needed. 8. What’s cluttering up your life? Paperwork which isn’t mine! 1. Name your favorite part of your body. 2. Name a book you have reread. 3. What is your astrology sign? 4. What’s your favorite time of day? 5. If money were no object, where would you go on your next trip? 6. What’s your most priceless possession? 7. Are you a dog lover, a cat lover or both? 9. Have you ever seen a double rainbow? So here are my nominees! Please check out their awesome blogs ~ you won’t be disappointed! Hugs! May the power of prayer comfort and lift your burdens. I, myself, believe in the power of prayer. I also believe in the Power of Positive Thinking. I have friends who ‘vibe’ for me as they are not inclined to call it prayer, but more akin to sending powerful, positive, healing vibrations to me. Believe me, I accept any and all good thoughts, healing feelings, powerful prayers etc. and I am blessed to say that I have enjoyed the fruits of their Reiki, their loving energy and their healing messages. So when I ask today for a bit of help from you all, I hope you won’t mind taking a moment of your time to think of me. You see, it’s been a really hard year for me. Perhaps I’m throwing a bit of a pity party this morning ~ because in reality, there’s nobody who is always 100% happy and inspirational 100% of the time ~ not even me, although I do try to be ~ I try with all of my heart and being to be. My body is tired and needs extra care now after this surgery. It seems that after 4 this year alone, it’s just not bouncing back the way it ought to and it’s having some difficulties in healing as I found out from my surgeon’s visit yesterday. I need my body to heal so that I can continue on with Christmas as it’s only a week away and I’m floundering under this new burden. Sometimes, we all need a bit of help and for some of us, it’s more difficult to ask for than it is to give. So I’m learning…and I”m asking…and I have faith that I’ll receive. I know we’re cyberly connected ~ that’s the beauty of blogs ~ so my request is simple…Please take a moment and send me a healing thought, message, vibe, prayer, Reiki ~ whatever you choose. I need a little extra strength today and I’m counting on you. I’m sending blessings out to the Universe with every post and especially this one so if you would please send back some love, I’d be most appreciative. I started counting my blessings and not my troubles this morning in hopes of turning this situation around, but I feel like I could use a bit of back up ~ hence my post and request. I believe we are a community ~ I believe that each of us has the power to change lives and together ~ well, together we can make miracles. I’m not asking for a miracle, just a little healing. I’m not dying any faster than anyone else ~ but I could sure use some powerful vibes to heal me. So, if you are inclined, I’d be grateful to you today. Hugs to all of you ~ you make my heart sing with your words, your blogs and your energies! Shine On my friends…Shine On!